Lord Ganesha is one of the most worshiped Hindu god who is known as the Remover of Obstacles. He is the elder son of Lord Shiva and Goddess Parvati and every year on the 4th day (Chaturthi) in the Hindu month of Bhadrapada, the Hindus celebrate Ganesh Chaturthi which is considered as the birthday of Lord Ganesha. There is a belief in the Hindus that they should not watch / see the moon on Ganesh Chaturthi day and if by chance they happen to see the moon in the night of Ganesh Chaturthi, they will be accused for no fault of theirs. To avoid unnecessary insults and false accuses, people avoid seeing moon on this day. However if someone happens to see the moon by chance on this festival day, they can save themselves from false accuses by reading or listening to the story of the Syamantaka Mani (jewel) and then sprinkling Akshat / Akshantalu (rice grains mixed with turmeric powder and chandan powder) on the head after worshipping Ganesha on this festival day. Lord Ganesha who has a peculiar yet cute physical appearance with a pot belly is too fond of sweets particularly Laddus, Modakas etc. He cannot control Himself at the very sight of delicious foods. Once on a Ganesh Chaturthi day as it was His birthday, He visited his friends and relatives to get blessing from them and as is the custom, people offered him sweets and other delicious food items. He ate almost everything that was offered to him in every house he visited and his pot belly extraordinary protruded out making his figure too funny with short stature. It was almost evening when he reached his home where everyone were eagerly waiting for Lord Ganesha. His mother Goddess Parvati lovingly asked him to take blessing from his father Lord Shiva. As per the Hindu custom, the males do Sashtanga Pranamam (touching the ground with toes, knees, hands, chin and nose) to seek blessings from God / their parents. Accordingly, Lord Ganesha tried to do Sashtanga Pranamam to his father but found it too difficult due to his extraordinarily protruding belly which was obstructing him from doing Sashtanga Pranamam. Lord Ganesha struggled a lot for this and with great difficulty when his toes were touching the ground, his face could not reach the ground. And if he tried to touch the ground with his chin and nose, his legs and toes were lifted up. Poor Ganesha went on struggling like this when the crescent moon on the head of Lord Shiva burst into laughter seeing the plight of Lord Ganesha. 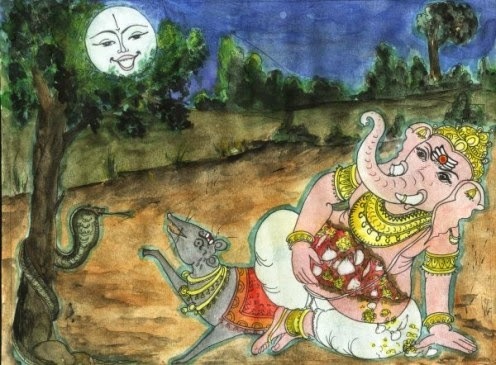 The evil eye of moon had its effect on Lord Ganesha whose tummy burst open and all the laddus he had rolled out. At this sight of his dear son, Mother Parvati was enraged and cursed moon saying, "Oh Moon, you are proud of your beautiful face and make fun of my dear little son". Let your beautiful face be not visible to the people on the Earth who adore your beauty. Let you remain in darkness for ever". Then Goddess Parvati immediately took one snake that was adorned as a necklace for Lord Shiva, she stuffed back all the laddus in her dear son's tummy and tied the snake round his producing stomach like a bandage. Hearing this powerful and terrible curse of Goddess Parvati, moon trembled with fear while all the sages and devatas got terrified and requested Parvati Devi to withdraw her curse and redeem moon from this terrible curse. Goddess Parvati calmed down and reduced the intensity / effect of curse saying that whoever see this crescent face of moon on Ganesh Chaturthi day will have to face false accuses. From thence people fear to see the crescent face of moon on this festival day to avoid unnecessary false accuses. Long long ago there lived a noble king named Satrajit who was a great devotee of Surya Bhagawan / Sun God and was gifted with a precious divine jewel named Syamantaka Mani which shone as bright as Sun and had the divine quality of producing unending wealth. Satrajit kept it in his pooja mandir and regularly worshiped it with great devotion. Now it so happened that Lord Krishna who ruled Dwaraka during those days happen to visit Satrajit and got the chance of seeing the divine jewel. "Oh Satrajit, entrust the Divine Gem with me and I shall protect it safely", said Lord Krishna. But Satrajit refused to handover Syamantaka Mani to Lord Krishna. However, this incident has left an impression in Satrajit's mind that Krishna is keen on possessing the Divine Gem. As the days passed on, Satrajit's brother Prasena once went for hunting the wild animals. Before going for a hunt, he expressed his desire of wearing the jewel to his brother Satyajit who agreed to give it but warned his brother to be careful with the divine jewel. Prasena happily went for hunting wearing the jewel, but on his way he was fiercely attacked by a lion who misunderstood the Divine Jewel to be a piece of flesh. The lion killed Prasena and walked away with the Divine Jewel in its mouth. On its way, the lion met with Jambavan (the powerful bear that helped Lord Rama in tracing Seeta Devi) who killed the lion, took the Divine Jewel and gifted the same to his dear daughter Jambavati. During this period, Rukmini Devi (wife of Lord Krishna) gave a bowl of kheer / payasam to her husband who happen to see the image of moon on the Ganesh Chaturthi day in the bowl of kheer. Being omniscient, Lord Krishna could foresee the false accuse on him by Satrajit. When Prasena did not return from his hunt, Satrajit sent his soldiers to trace out his brother and came to know about the death of his brother. Satrajit thought that this is the act of the Yadava King - Lord Krishna - who had intended to take away the Divine Jewel and thus falsely accused Lord Krishna for stealing Syamantaka Mani. In order to prove his innocence Lord Krishna set out for tracing the whereabouts of the gem. On his way, he came across the lifeless body of Prasena and then Lord Krishna followed the track of the foot prints which ended near the dead lion. From this place Krishna saw the foot prints of another animal and he thus followed the track which led to a cave. When Lord Krishna went inside the cave, he saw Jambavati with the Syamantaka Gem whom he inquired about the gem. At this moment, Jambavan came to the spot and got angry with Krishna as he thought that Krishna was stealing the gem. When Lord Krishna asked for the gem he refused to give and invited Krishna for a dual war or dwanda yudham and there was a fierce battle between the two. Though Jambavan was old enough yet he was strong enough, however he was exhausted after the unending war and wondered who could this great warrior be whom he could not defeat. Thus Jambavan questioned, "Who are you? O great man. Lord Krishna said, "Don't you remember me Jambavan? You desired for having a fight with me and here I fulfilled it." Saying so, Lord Krishna showed his previous incarnation of Lord Rama to Jambavan who was too happy to see Lord Rama and bowed down to him. 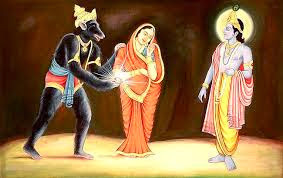 Jambavan went inside his cave, brought Syamantaka gem and gave it along with his dear daughter Jambavati to Lord Krishna. Thus Jambavati became one of the 8 wives of Lord Krishna. Lord Krishna returned the Divine gem to Satrajit and thus proved himself innocent. Satrajit repented for falsely accusing Krishna, so he gave away the Divine Gem - Syamataka Mani - to Krishna for a safe custody. He also he gave his dear daughter Satyabhama in marriage to Lord Krishna who later became the 2nd dearest wife of Lord Krishna, the first being Rukmini Devi. Thus Lord Krishna could prove his innocence and the devotees who read or listen to the story of Syamantaka Mani on Ganesh Chaturthi day after performing pooja could protect themselves from false accuses. Moreover, reciting of Ganesh Vandanam and visiting Ganesha temple would help the devotees in overcoming all obstacles in life.